UPDATE: According to officials, contrary to initial reports of a shooting, the attacker used a car and knife. The campus is secure and classes have been cancelled. The eight people taken to the hospital reportedly have non-life-threatening injuries. This story has been updated to reflect this news. Update to this story here. 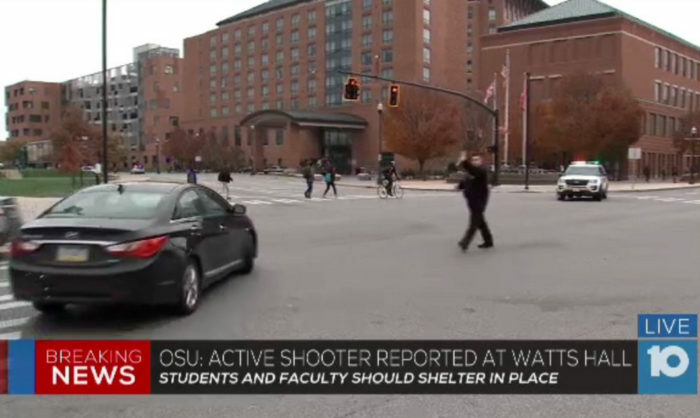 It was not an active shooter on campus. OSU Police posted the same messages. A student Periscoped first responders on the scene. He said he was next door to Watts Hall and did not hear any gunshots. His first notice of the incident was a university emergency message. The student was not aware of any victims nor did he report seeing or hearing a gunman. The student noted the presence of national news media icluding CNN and NBC at the scene. Local media is on site also.